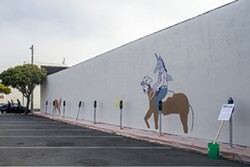 Dave Van Patten's first day of work on a wall of The Shanty. 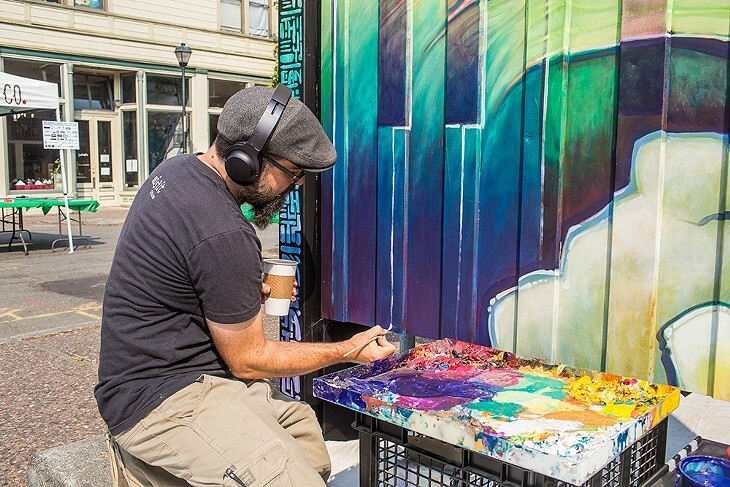 Stock Schlueter dips his paintbrush in a deep forest green and pit-pats leaves onto a tree in the far-right corner of his painting in Opera Alley. His piece is an ode to a spot along Madden Creek he's grown fond of. Beginning Aug. 11, more than 20 local and visiting artists transformed walls along Opera Alley (plus one outlier on Fifth Street) with murals as part of Eureka's first Street Art Festival. The week-long event ended with a street party Aug. 18 to celebrate the completion of the works. The artists were all compensated, either by cash or barter, and their material costs reimbursed. Local or not, each artist participating had their own unique ties to Northern California and many expressed feeling honored to take part in the inaugural festival. Schlueter's great aunt came into the area from Weaverville in the 1800s on a hunting expedition. She and her husband arrived in Hobo Gultch and fell in love with the area, vowing to come back. Eventually selling the cleaning business they owned in the Bay Area, they bought out a homestead in Burnt Ranch. Before he was born, Schlueter's mother would come visit her aunt on the ranch, where his father, a World War II veteran from Chicago, was renting a cabin on the homestead and working in the logging industry. "The rest is history," Schlueter says with a chuckle. His parents settled in Burnt Ranch before having him. "They were visiting Oakland and I decided it was time to come out, I had places to go, things to see, but I grew up a very rural life. Outhouses, trapline, hunting, fishing." "Growing up was like living in the 1800s back then," Schlueter recalls, "every wild creature tame and every tame creature wild. It was this menagerie of life that was my first recollection of being here on this planet." Schlueter graduated from Hoopa Valley High School with scholarships for wrestling and football, but he'd always recalled being keen to art projects. He spent his years after college felling timber with his father and saved up a bit of money before realizing he wasn't going to be a painter if he kept doing that because he was making too good money. So he sold everything he owned and traded two of his paintings for a 1951 Chevy flatbed ton-and-a-half truck. "And I built a gypsy-wagon camper on the back of it," he says pausing from painting to grin, "wood stove, the whole smash." It was his studio and his residence for five or six years. He lived at creeks, caught trout, ate rice and painted. He'd put together shows at the bars or anywhere that would have him. That was when he first felt he was surviving as an artist. Schlueter's piece for the art festival is a painting of Madden Creek, near Willow Creek. To him it represents more than just Humboldt County. He recalls seeing the creek completely destroyed in the 1964 flood. "It was wiped out — no trees, nothin' along the edge of it, gutted completely to the river," he said. As Schlueter remembered being fortunate enough to witness the rebirth of Madden Creek, he paused to tell a side story from earlier in the festival. A couple traveling from San Diego asked where it was and, despite its semi-remote location, decided to try to find it. After some trouble and help from Schlueter, the couple eventually made it and sent him a text message with a picture from the very spot Schlueter was painting. "That's kind of the reason I paint landscapes so much — to show people what a beautiful place we live in," he says. "And maybe if we realize that we'll take better care of it and each other and etcetera, etcetera." 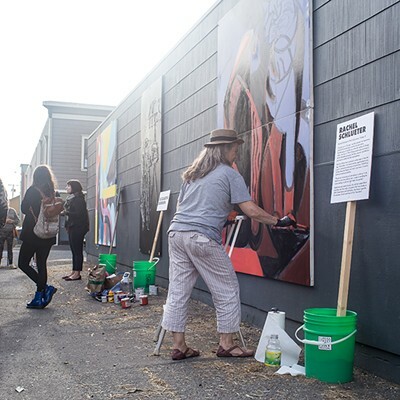 Organizing the festival took determined individuals on several fronts, including financial and staff support from Black Faun Gallery, Humboldt Cider Co. and the city of Eureka, along with aid from 26 other sponsors. 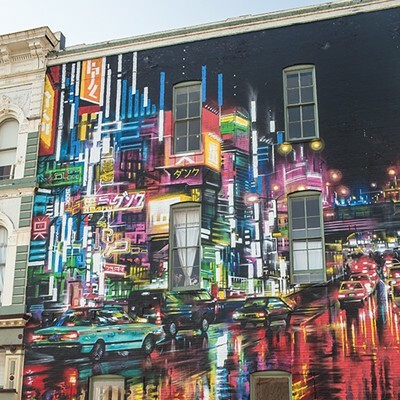 Kevin Bourke, owner of the Black Faun Art Gallery in Old Town, and his staff originally worked to sponsor the two murals that went up last year — Dan Kitchener's "Electric-City" on the Buhne building and Duncan Jago's "Mr. Jago Mural" on the De Paul building — that served as blueprint pieces that eventually helped pave the way for the festival. 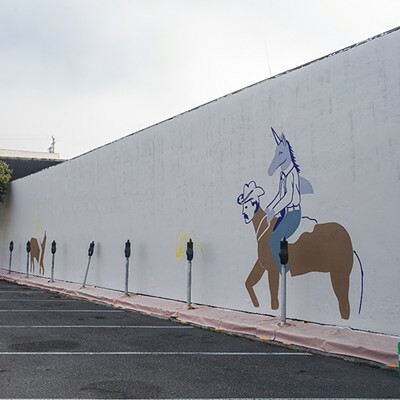 Claire Reynolds, the Black Faun Gallery's director, credits the local business community for its positive reception of the initial murals that went up last summer. 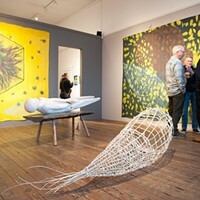 She also credits the city of Eureka for helping put the gallery into contact with Michelle Cartledge of Humboldt Cider Co., who had also approached the city about doing an art festival. "Folks at the city facilitated putting us together and the rest began to fall into place," Reynolds says. Throughout the week, she was busy leading daily evening tours and putting up art on walls that were previously unavailable. A face seen nearly everywhere Reynolds could be found was community organizer Jenna Catsos, who was integral in making the festival a reality. Her hands have been busy with everything from seeking out vendors, bands and artists for Saturday's festivities to actually creating the design for the publications for the event. 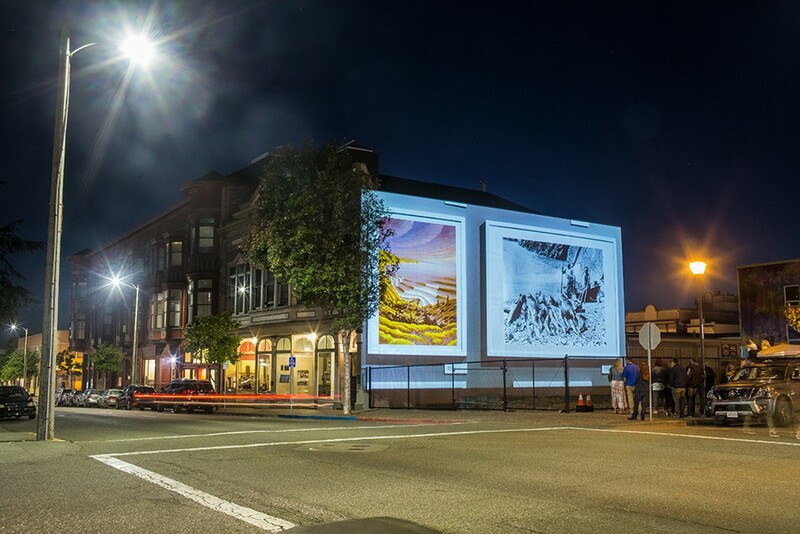 "Helping organize this festival was getting to work with two things I love: Eureka and its community, and art. The energy of the town and the potential they see really spoke to me," says Catsos. 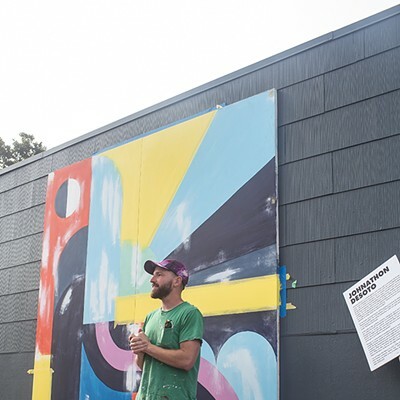 Not a far distance from Schlueter's installation is The Shanty, where Long Beach artist Dave Van Patten has been painting with the assistance of friend and fellow artist James Carey. Van Patten first found himself in Humboldt County in 2012, visiting his sister at Humboldt State University. At the time, she was a bartender at the Local Beer Bar in Eureka and had linked him up with owners Darren and Michelle Cartledge to do a mural. After its closing and the opening of the Humboldt Cider Co. taproom, he was brought in again to do artwork for the place and branding for the company. 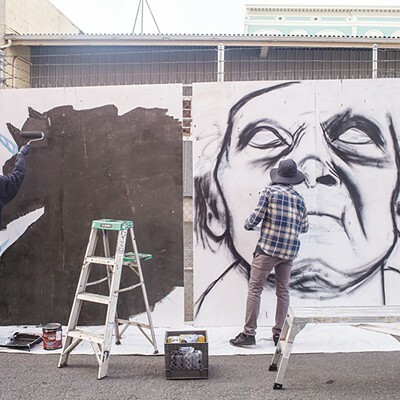 For the Eureka Street Art Festival, Humboldt Cider Co. reached out to Van Patten — again. "Darren and Michelle came to me and gave options of walls. I felt like I had enough inspiration to be able to take on this one, so I did. Thankfully, with the help of my friend James Carey, we've stayed on schedule to finish," says Van Patten. Van Patten says he drew inspiration for some of the characters in the painting from The Beatles album Magical Mystery Tour, blended with a "creepy JimHenson" style. "A lot of the other influence came from The Shanty bar itself," he says. "It's got a realness to it, kind of a grittiness but also a real community-type atmosphere." Not all community response has been positive. Van Patten says some have argued events like the festival result in a "gentrification" to the area but he sees otherwise. Over the years, Van Patten says he's seen Eureka work as a community to make changes for the good. "Obviously no one wants rent to go up or to see the soul of the community get wiped away, but I feel like the change I've seen Eureka endure over the years has been positive." 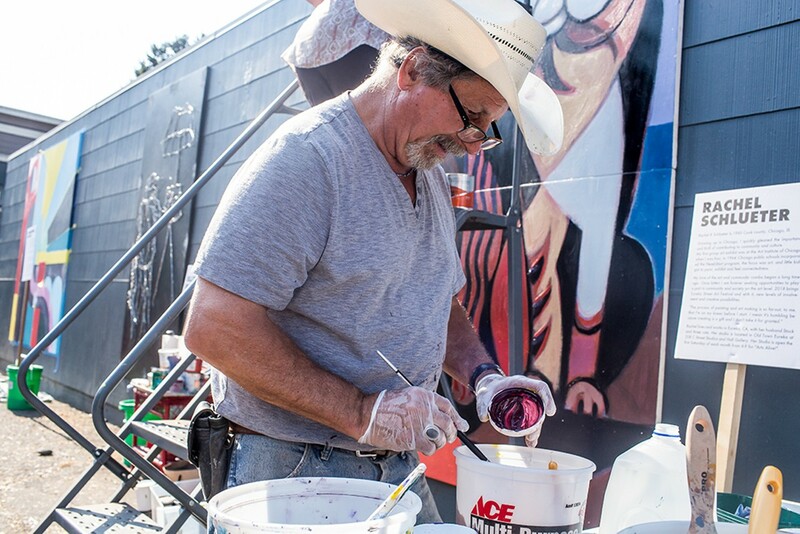 Van Patten says he feels privileged to take part in the first of what he hopes will be an annual street art festival in Eureka. 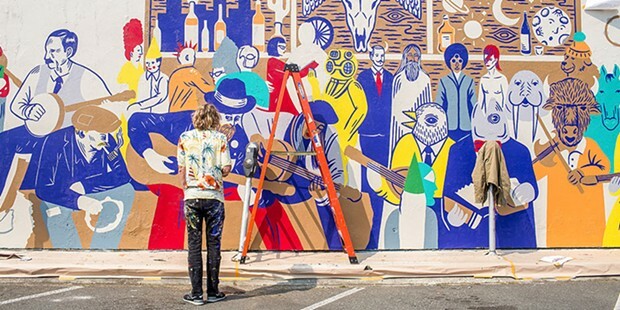 "To be able to paint the wall of a valued bar is a total honor — that comes from the bottom of my heart. I'm extremely grateful." Directly to Van Patten's right is the 36-by-18-foot, east-facing wall of Mendenhall Studios. 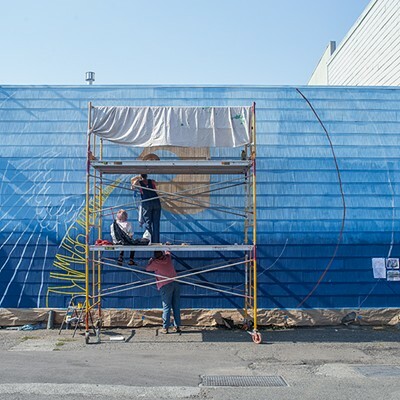 Parked nearly against it: a scaffold, a bucket lift and four women collaborating on a mural titled "Spin." With the help of Julie McNiel at Mendenhall Studios, the four got a grant from the Ingrid Nickelsen Trust to take on their largest project to date. 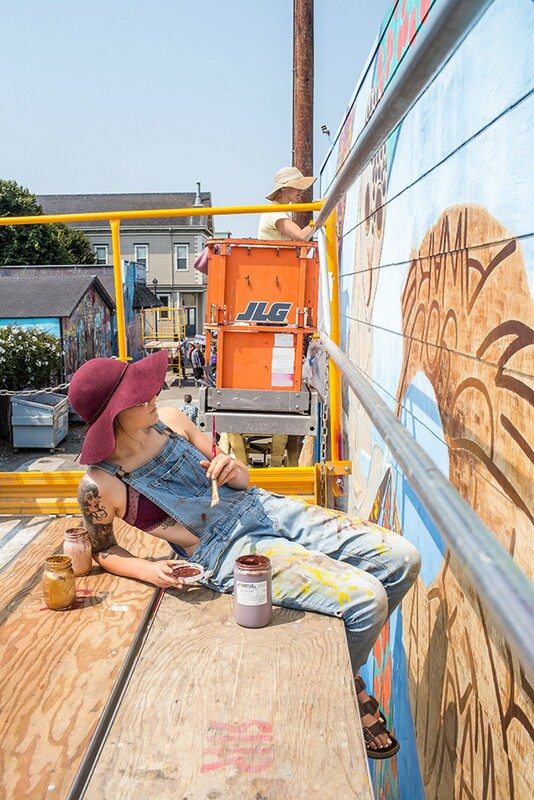 One of the artists working on the mural is 21-year-old Ellie Gainey, who has a space at Mendenhall Studio and is art-neighbors with fellow collaborator Courtney Karnes. The other two contributing to the mural are Siren Song owner Phyllis Barba and her daughter Zaila Barba-Oliveri, whom Gainey met just as they began working. Gainey had never worked on a scaffold before. "It's been fun, I've been calling it an adult jungle gym," she says with a laugh. "But it does present a challenge when you can't see your work for the day without climbing down and stepping far back." 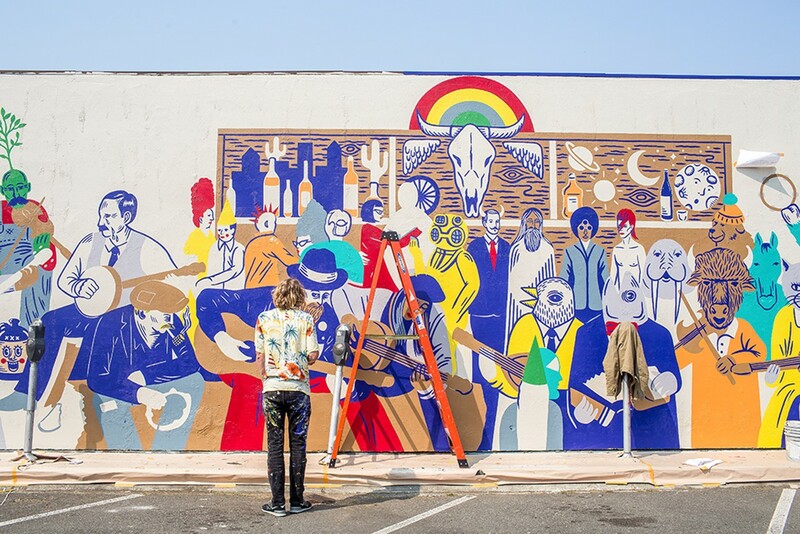 The "dream-esque" concept for the mural pays tribute to several aspects of Humboldt County including the historic nature of taking part in the first ever Eureka Street Art Festival. Some of Karnes' contributions include the eggs of steelhead swirling into various stages of life. The columbine flowers Barba patterns into the mural are native to the area as well. Part of Gainey's contribution is a lyric from a song titled "The Breeze," by Dr. Dog. "It's about striving for our goals and dreams we wish to manifest in our life. Filling our early mornings and late nights pursuing these ideas we want most," she says. 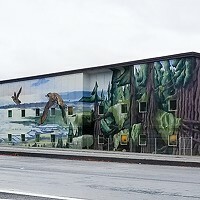 A level below on the scaffold, Karnes outlines a section of mural filled with rainbow trout eggs growing into steelhead. Karnes has been living in Humboldt County for 14 years, ever since the school bus she was traveling in broke down. Before then, she was caravanning from place to place attending rainbow gatherings — big outdoor peace celebrations. "Spin" is the largest piece Karnes has worked on and the first requiring a scaffold. 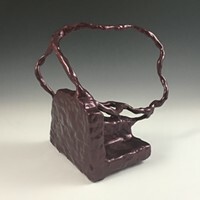 Normally, she can be found sculpting or jewelry-smithing in her space at Mendenhall Studios. "It means a lot to take part in this," she says. 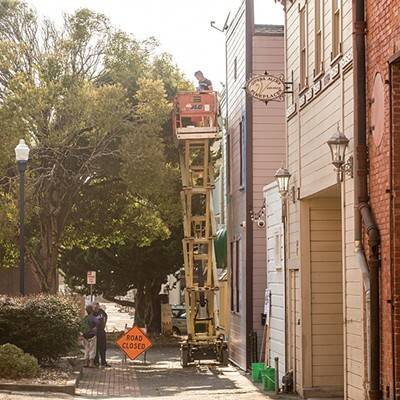 "I live in Old Town, so just to be here putting something up for the whole community is a special experience." 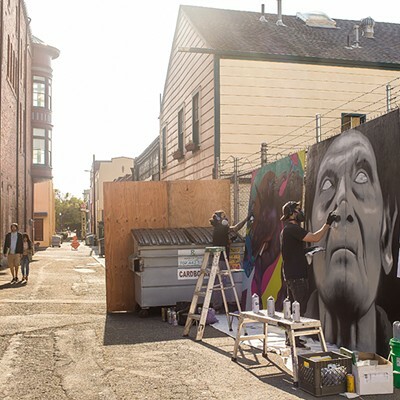 Farther north in Opera Alley, sporting a bubblegum-magenta mohawk is Blake Reagan, painting the entire alley wall of The Speakeasy. Reagan is equipped with an orange man-lift provided to artists by sponsors of the festival. Reagan moved to the area 13 years ago and, like many, fell in love with the redwoods. He became involved with activism, mainly tree-sitting and support in fighting to keep the old growth trees from being removed. Before landing here, he hadn't really done much art. For his mural on The Speakeasy, each workday has been roughly 10 to 12 hours. "I get up around 6:30 or 7. Once the sun comes up, you get the coffee, you get to work, then the sun goes down and you can't really work in the dark since colors change." The center of Reagan's mural depicts singer Nina Kristopherson and is surrounded with what he calls a "Billy Holiday vibe." Reagan wanted his piece to channel the energy of the building, which has vintage decor. He was also inspired by the Art Deco throughout Old Town, elements of which he purposefully included at the top of his piece. Looking up at the mural, Reagan can't seem to pick one source of inspiration. He says the clouds, music, pattern and color are all sources for his work. 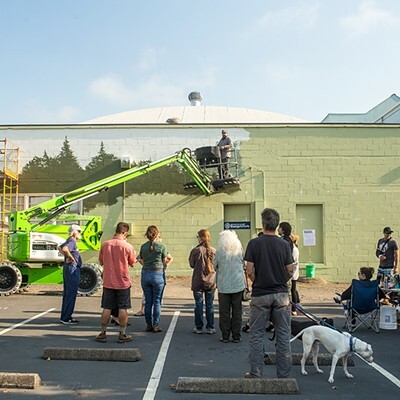 "I just got a paintin' problem," he says with a wide grin, looking up at the 20-by-30-foot building. "I can't really stop and I like goin' big." Alexander Woodard is a freelance writer and photographer. He lives in Arcata.